Super strength enzymatic pain reliever! 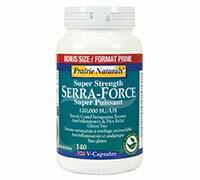 Super Strength Serra-Force contains 120,000 units of enzyme activity as an effective and safe inflammation and pain remedy. Unlike nonsteroidal anti-inflammatory drugs (NSAIDs) and prescription anti-inflammatory drugs, Serra-Force does not cause ulcers and stomach bleeding. More than just a powerful anti-inflammatory agent, Super Strength Serra-Force can also help chronic sinusitis by improving the elimination of mucus. It may also enhance cardiovascular health by breaking down fibrin and blood clots, as well as relieve chronic and acute pain and reduce swelling. Recommended by enlightened doctors. 100% VEGAN. TESTED GLUTEN-FREE. Contains NO soy, dairy, eggs, gluten, flavours, colours, preservatives, sweeteners, GMO ingredients.